Multiplexing optimizes bandwidth use in the isochronous phase. Since requirements on data sampling intervals vary from application to application, not all controlled nodes must be polled in every cycle. While many motion control applications, for example, must constantly provide drives with information and poll their feedback data in every cycle, sensor data only has to be polled once every three cycles for temperature measurement. 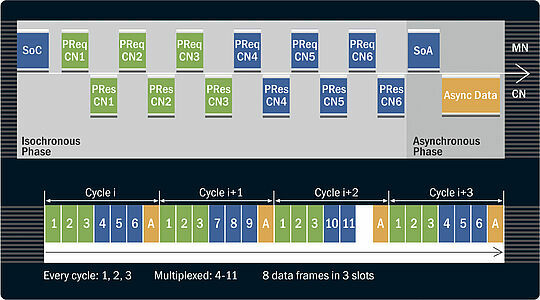 With multiplexing, controlled nodes with low priority data share a time slot within the isochronous phase. They take turns so that one device utilizes the first, a second device the second and the third device the third cycle (every three cycles) to transfer their respective data. The MN assigns and manages shared time slots for these groups of nodes.